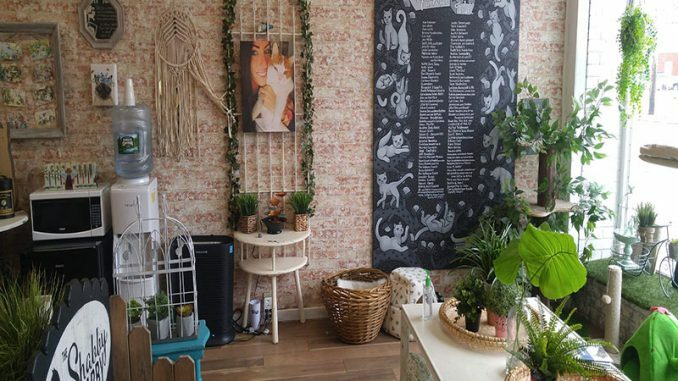 A Kitten Kadoodle Coffee Cafe is set to open in Selden at the end of May, making it the second cat cafe, a place where free-roaming cats can be watched and played with, on Long Island. The owner of A Kitten Kadoodle Coffee Cafe, Jennifer Rose Sinz, is a web and graphic designer who has many animals — 12 cats, six ducks and four chickens — at her Lake Ronkonkoma house. “I wanted a place that was smack in the middle of Long Island, where many people live, so that people don’t have to go all the way to New York City,” Sinz said. The world’s first cat cafe opened in Taipei, Taiwan in 1998. It gave people a chance to wind down after a hectic day, but it really took off when one opened in Japan in 2005. Nearly a decade later in 2014, the first permanent cafe in the United States opened in Oakland, California. The cafe will serve vegan and vegetarian food, the only place in a 15-mile radius, Sinz said. She plans to have 20 cats living in the cafe at a time. People will be able to hang out with the cats for up to three hours by making just a $2 donation. “This business is family-oriented, and it is not a competition. The three things I want to accomplish is to educate people on cats, have them relax and get cats adopted,” she said. The Shabby Tabby, the first cat cafe on Long Island, charges $15 per hour and fosters 10-15 cats at a time from their partner, the Golden Paw Society in Huntington Station, an exclusively charitable all volunteer-run organization that houses about 50 cats at a time who have been rescued from other shelters that were going to euthanize them. After a Kickstarter campaign that launched in May 2018 raised $30,000 in 45 days for the renovation of the space at 249 W Main Street in Sayville, Shea, a nurse at Stony Brook Southampton cafe on Long Island, was able to open the first cat cafe on Long Island. Sharing information is a key component of Shea’s vision with the goal of raising awareness for homeless cats, especially during kitten season. Opening the cafe will help reduce the overcrowding of homeless cats at local shelters, according to Shea. Shea became involved in cat rescue after her cat died and she saw how many cats needed help on Long Island. Between 60 and 100 million domestic cats are homeless in the U.S., a 2014 study published by People for the Ethical Treatment of Animals (PETA) shows. The Collaboratory examines evidence-based assessments and treatments in clinical psychology of nonhuman animals with the goal of improving their relationships with their human caretakers. Cats calm humans during stressful situations such as interacting with new people and may be especially beneficial to people with social anxiety, serving as a sense of security, Kristyn Vitale, a postdoctoral scholar at Oregon State University whose dissertation examines the influence of kitten training and socialization classes on the human-cat bond, said.